Ladies, step aside. 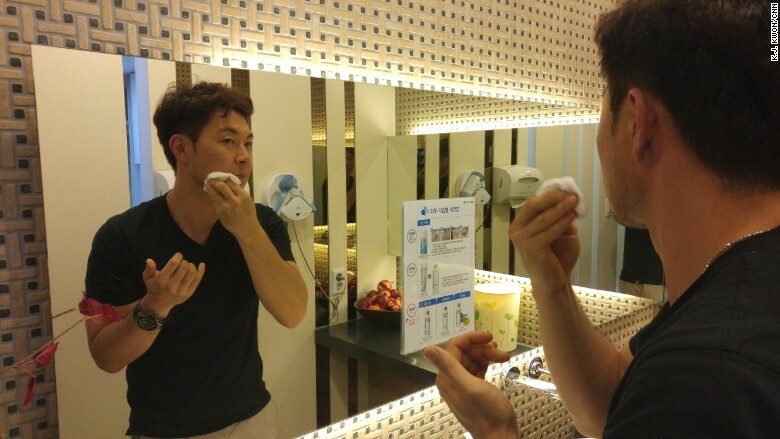 In South Korea, cosmetics companies are now targeting men. It's a trend that clashes with Western ideas about masculinity and gender, but Korean men are spending a ton of money on cosmetics products in order to improve their skin and appearance. South Korean men are the world's top per-capita consumers of skincare products, with four times the purchases of runner-up Denmark, according to Euromonitor. The grooming industry is worth more than $1 billion, with projected growth of nearly 50% over the next five years. Korean men are not just buying aftershave and lotion, either. Demand is increasing for anti-aging products, masks and mists. "We have a proverb," Lee said. "If you buy something, you must choose the one which has a good appearance." In South Korea's ultra-competitive society, he said that kind of decision-making also applies to people. When employers are looking to hire, for example, many of the candidates will have come from excellent universities and have similar qualifications. One thing that can set a candidate apart is their appearance. "If you want to have a higher salary, you must do the best for your human capital," he explained. Chris Hong, an business executive about to hit the big 4-0 this year, is the industry's ideal customer. His regimen includes twice-yearly Botox injections, as well as laser treatments to smooth out imperfections on his face. Hong freely admits that he spends more time, money and effort on beauty than his wife. "Whenever you do more grooming you feel better," Hong said. "I don't want to be looked at as older." International names including Lab Series and Biotherm are among the most popular brands. But Minji Kim, an analyst at Euromonitor, said local companies are aggressively competing for male customers. "Almost all domestic players have launched men's lines." said Kim, who singled out local manufacturers AmorePacific and LG Household & House Care as homegrown success stories. AmorePacific has even launched a special military line, which features natural camouflage makeup and post-training cooling and whitening masks. According to the company, an estimated 70% of South Korea's military men use cosmetics. "Interest ... in cosmetic products begins during [military service] -- due to the frequent outdoor activity that requires sun protection and skin care in general," the company said in an email.